We rely on our hands and the wrist joints that make them so mobile. We need them so we can undertake an abundance of day-to-day tasks. It’s only natural that they come under some wear and tear along the way. Doctors use hand and wrist surgery to treat a variety of different conditions. Examples include Carpal Tunnel Syndrome and Dupuytren’s Contracture. Surgery is also needed to treat diseases and emergency traumas. The human hands are notorious for developing some of the more complex, intriguing scars post-operation. There are a variety of different types that can develop. Our hands heal differently to other parts of the body because the skin is different. It’s thicker, and that means it’s also tougher with ridges in the skin of the palm. The hands are also more sensitive than other parts of the body. Did you know, there are almost 200,000 neurons (nerve cells) transmitting signals from our hand muscles up to our brain? How do you define a scar? ‘Scar’ is a common term given to a permanent mark left on the skin following the closure, and complete healing of a wound or injury. Scars are described as a permanent mark because although most will fade in colour and distinction over time, they will never completely disappear no matter how pale they become. Miss Hajipour showed me respect in every way, I really can’t praise her enough. I have suffered from hand pain for years, after she operated the relief has been life changing. So thank you Miss Hajipour, The Alexandra has a true gem. If everyone could receive the care and attention I have we would have a fabulous system. So thanks again Miss Hajipour you are a star. Patient at BMI The Alexandra Hospital, 27th February 2018. To read more reviews please click here. Scars can present themselves as fine lines across the surface of the skin, or pitted holes that divot into the surface of the skin. Fine line scars are common after minor injuries that result in smaller cuts to the skin. Firstly, they will present themselves as a red line with small swelling. Itchiness is common at this stage. The line will grow paler, gradually, and flatten out as time goes on. With darker skin types scars may appear brown. Scars are more obvious on tanned skin because scar tissue cannot tan. Keloid scars are the result of tissue overgrowth. This occurs when too much collagen is produced at the wound. Collagen is the main structural protein found in skin and other similar connective tissues. The problem here is that the scar tissue will continue to grow even after the wound has been fully healed. Unlike typical fine line scars, keloid scars are raised above the surface of the skin. In the early stages of formation they appear red or purple, but gradually become paler as time goes on. They are known for their tight formations resulting in restricted joint movement. 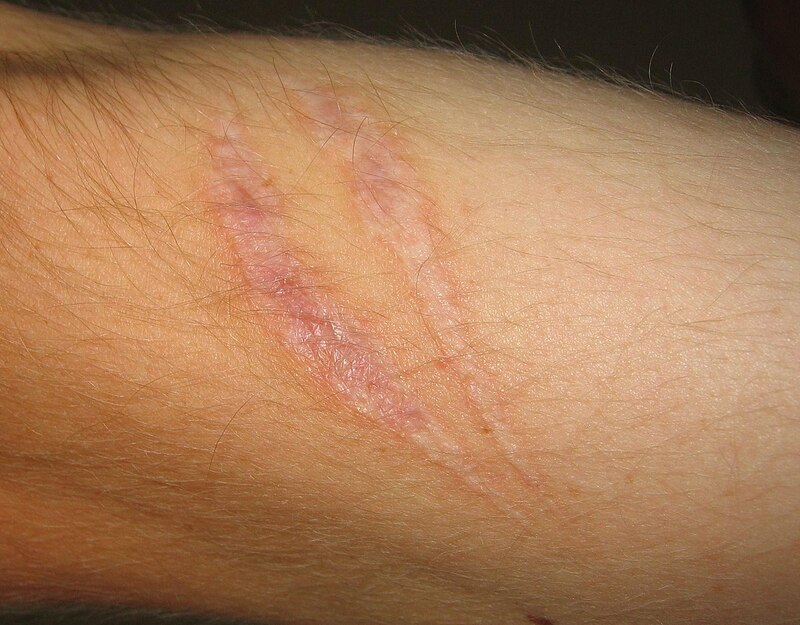 Hypertrophic scars are similar to keloid scars in the sense that they are a result of excess collagen being produced around the site of the wound. The difference here is that there is less collagen being produced, and this means that unlike keloid scars, the scarring does not extend beyond the boundary of the wound. It is physically impossible to completely remove a scar from the surface of your skin, however, scars do gradually gain a paler colour over time. So it is quite likely that more discrete scars will become less noticeable. However, there are a number of treatments that are available should you wish. You may want to have treatment on your scars if they are painful, irritable, restricting the movement of a joint or don’t look aesthetically pleasing. Your GP will likely refer you to a dermatologist who can assess your scar tissue and recommend the correct course of action. Alternatively, they may refer you to a plastic surgeon for more serious scarring issues. It is important to remember that the treatments below are not typically available with the NHS – so you should expect to pay for any treatment privately. Surgery can sometimes be used to improve a scar by making it appear more in fitting with the rest of the skin surface. Surgical procedures such as skin grafts will help to make problematic scars less noticeable. They can also help alleviate pain and tightness, especially around joints. It is important to note that scar reduction surgery can often be a heavily invasive treatment, and as such it is not suitable, or recommended for everyone. You need to weigh up the pros and cons before making a decision on whether to pursue surgery. Not only are there the general risks that accompany any surgical procedure, but there’s also a small chance that the surgery could make your scar worse. For those who are set on scar reduction surgery we strongly suggest you go with a trained, certified and experienced plastic surgeon. In this case plastic surgeons are expected to discuss everything with you prior to the procedure. Make sure you take this opportunity to fully understand the procedure, risks and expected results. Silicone gels, or silicone sheets, can be used when the wound is still healing to help soften the tissue and ultimately flatten the scar. This lowers the chances of a keloid scar forming. Along with a cooling agent, they can also relieve symptoms of itchiness and irritation. The beauty of silicone sheets is that they can be re-used after a wash. The NHS advise that for silicone gels to be fully effective, a patient should have the product placed over their scar for around twelve hours a day for at least three months. Your GP will be able to recommend a suitable silicone gel or sheet treatment if applicable, but if you can’t book in an appointment, then a general pharmacist should be able to help you out. I felt confident about having Miss Hajipour as my consultant from my first consultation: she is personable, thorough and easy to talk to. I feel very much at ease in her company. My hand surgery (October 2017) has been most successful and I am looking forward to having my other hand operated on by Miss Hajipour in the future. Patient at BMI The Alexandra Hospital, 21st January 2018. To read more reviews please click here. Certain cosmetics companies have created specially-designed make up to cover scars and blend in with your natural skin tone, and these are often available from your local pharmacy. These can be particularly useful when you have a facial scar as they are usable alongside contemporary make up. Products such as the Scar Repairex Ultra Cream by PharmaClinix are specifically designed to reduce the appearance of old or stubborn scars. Products like these are made with a high strength formula that contains anti-inflammatory ingredients to help treat any swelling or irritation that may be causing you a problem. The UltraCream also includes 10% Vitamin C which encourages the production of healthy collagen. First of all, no long-term study has proven laser therapy to be fully effective at treating scars. It is highly recommended that you seek out this treatment from a trained and certified medical practitioner only. Otherwise, you run the risk of worsening the problematic scar. Laser therapy can be used to resurface a sunken or pitted scar by stimulating collagen production. Here, dermatologists use high-powered lasers to remove the top layer of scar tissue. The laser also penetrates to the skin’s middle layers. This both tightens and smooths the skin. Corticosteroid injections can be administered to treat certain cases keloid or hypertrophic scarring. The scar is injected several times in a number of different places. This reduces the swelling and acts to flatten the scar tissue. This process may need to be repeated. A usual course of corticosteroid injections will last between four to six weeks, with injections given on three occasions. The treatment is staggered to assess your body’s response to the steroids. Doses can be adjusted based on past performance. If injections aren’t your thing, there are also steroid-infused tapes available that can be placed on top of keloid scars to flatten them out. They are administered for twelve hour periods on a daily basis. Cryotherapy is any treatment that involves the use of freezing, or near-freezing temperatures. This sounds odd, and perhaps quite scary, but don’t be alarmed. Liquid nitrogen can be used to freeze keloid scars in the early stages of their formation. If they are caught early, cryotherapy is another method of flattening this scar tissue out before it grows into anything problematic. A side effect of cryotherapy is that it can lighten the colour of the skin in the area being treated. You can read about cryotherapy in more detail here. I was given advice on how to achieve the best outcome for my fractured wrist. There was good linked up care between consultant, physio and hand therapist. The fracture was severe, and by following Miss Hajipour’s advice the repair has been a significant success. Patient at Wythenshawe Hospital, 10th March 2017. To read more reviews please click here. Having trouble with your hand or wrist? You can fill out the contact form below to make an enquiry.